Like many of my Kotaku brethren and sistren, I really dig United Front's Sleeping Dogs. I'm taking my time playing it, doing a lot of the sidequests, and I can tell that when I do finish, I'll gladly pay for add-on content to expand the game. Earn major respect by boosting your Cop, Face and Triad Experience Points and gaining new abilities. Gives you 8,250 Triad, 4,500 Cop and 4,500 extra Face Experience Points. For the ultimate in upgrades combine with the Top Dog Silver Pack. Go old school with a killer look and ride straight out of the 80s! New hair, accessories, clothes and boots are combined with an 80s style kung fu van to complete the look. Items come with their own buffs, increasing your damage resistance, Triad and Face experience and striking damage. So, three of the pieces of DLC quickly unlock things that are already in the game, and one is basically just a scavenger hunt for more money. Only that last one, the retro triad pack, is actual new content. Something about this hits me wrong. I know we've seen this kind of thing before—paying to get through the game faster, free-to-play microtransactions, etc. And of course, no one is forcing us to buy this stuff—it's optional. And heck, this article at Nightmare Mode puts forth the idea that this kind of thing is perfectly normal, and that really, "Everything should be DLC." When I pay $60 for a narrative about a Renaissance assassin I expect all the chapters to be included, instead of having the publisher hold 2 of the middle chapters hostage for more cash. But if there were a Final Fantasy game that offered me the option to pay to receive a side quest's reward (let's say it is a sword) instead of grinding through said side quest, I would give out my credit card number in a heartbeat! So yeah, are you hearing, SquareEnix? Want to get out of the financial mess you are in? Then become like Zynga! I can't get with this line of thinking, not fully, anyway. 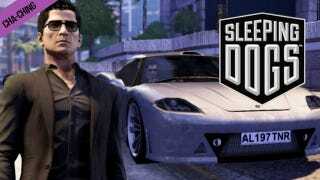 As I looked at the Sleeping Dogs DLC, I couldn't help but think… "Isn't this what cheat codes are for?" Rockstar's Grand Theft Auto games, which provide the open-world template upon which Sleeping Dogs is directly based—have certainly never sold "Pay to progress" DLC. Want a ton of cash, or sweet armor, or all the guns? Here, enter any of these codes. Imagine if Bethesda released Skyrim DLC that gave you a ton more money. In that game, I can enter any of these console commands to summon myself some gear, or a horse, or hell, anything else in the game. I mentioned that I thought the DLC was weird to my colleagues, and Stephen challenged my thinking. Stephen: You're against people who don't have time paying to get ahead in their single-player game? Why? Kirk: I'm wrestling with how I feel about it. I don't mind it for the reasons you say, it's okay for people to pay to move faster, but also, aren't there cheat codes for this kind of thing? Codes that unlock gear in a game? Something about paying a publisher after the fact to unlock goodies in a game seems weird. Something something ownership of a game something tinkering something. Stephen: So you're saying that if you pay for a $60 game, you should be able to access all content immediately with zero sweat put into it. Stephen: Then what are you saying? Kirk: If you want to do stuff like unlock a late-game outfit or raise your prestige, there should be cheat codes for that? Stephen: Because there used to be? Or is there another good reason? Kirk: Because, on principle, you should be able to access the stuff if you WANT it, but to get the "true" experience you play the game. But paying more for "downloadable content" that is not actually content is weird. It's not new, I realize, it's in a billion games. But sleeping dogs isn't free-to-play, it's a full-priced singleplayer only game. Stephen: So in your gamer bill of rights, there would be a cheat code for every game that unlocked everything? Or just in games where the publisher might have considered charging for those unlocks? Kirk: There would be cheat codes for everything. Take skyrim. On PC in skyrim, I can just enter console commands and conjure anything I want. I don't, because I like playing the game the way it was intended. But it'd be ridiculous for Bethesda to release a DLC pack that just gives me like, 1,000,000 gold pieces. Stephen: What would the cheat code be for getting a fireflower in Mario? Okay that last part was just Stephen being Stephen. But the question remains—where is the line? When does DLC feel like a cash-in, and where does it feel merited? I think that when it comes down to it, downloadable content should include, well, content. Square Enix, the publisher of Sleeping Dogs, had a similar setup with Eidos' (great) open-world action game Just Cause 2. That game also got a whole bunch of small, cheap DLC. But all of the DLC for Just Cause 2 involved actual content. Guns, tools, vehicles… heck, I even bought some assault rifle or something once because hey, it was a dollar! I'll pay a dollar for a cool gun in a game I really like. But if it's just in-game money, or clothes I'd unlock later… something in my video game DNA rebells at the idea of having to pay to unlock that stuff. Video game ownership has become a complex issues in this age of downloadable games, but I don't think it's too much to ask that if I bought a game, I should be allowed to access all of it if I want to. I'll almost always prefer to play the game the way it was intended, but come on, game-makers—leave me some cheat codes. Do We Own Our Steam Games? If I'm messing around in a game world and I want to conjure a tank and some money for myself, I should be reaching for the console commands, not for my wallet.